Elizabeth Taylor is one of film's most famous women, having starred in over fifty films and having won two Academy Awards. She also attracted attention because of her eight marriages and her devotion to raising money for research to fight acquired immune deficiency syndrome (AIDS; a virus that destroys the body's ability to fight off infection). 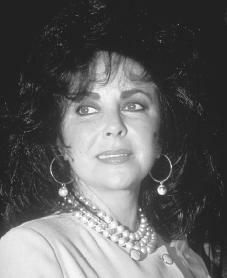 Elizabeth Rosemond Taylor was born in London, England, on February 27, 1932, to American parents Francis and Sara Taylor. Her father was a successful art dealer who had his own gallery in London. Her mother was an actress who had been successful before marriage under the stage name Sara Sothern. Taylor has an older brother, Howard, who was born two years earlier. In 1939 the family moved to Los Angeles, California, where Taylor was encouraged and coached by her mother to seek work in the motion picture industry. Taylor was signed by Universal in 1941 for $200 a week. In 1942 Taylor signed a contract with Metro-Goldwyn-Mayer, the biggest and best studio of the time, and landed a part in Lassie Come Home. In 1943 she was cast in National Velvet, the story of a young woman who wins a horse in the lottery and rides it in England's Grand National Steeplechase. Taylor was so determined to play the role that she exercised and dieted for four months. During filming she was thrown from a horse and suffered a broken back, but she forced herself to finish the project. National Velvet became both a critical and commercial success. Taylor loved her work, the costumes, the makeup, and the attention. Columnist Hedda Hopper, a friend of Taylor's mother, declared that at fifteen Elizabeth was the most beautiful woman in the world. Making films such as Little Women, Father of the Bride, Cynthia, and A Place in the Sun, Taylor began to gain a reputation as a moody actress who demanded special treatment. In May 1950 she married Conrad N. Hilton Jr., whose family owned a chain of hotels, but the union lasted less than a year. After divorcing Hilton, she married British actor Michael Wilding in February 1952. They had two sons. Between 1952 and 1956 Elizabeth Taylor played in many romantic films that did not demand great acting talent. In 1956 she played opposite James Dean (1931–1955) in Giant, followed by the powerful Raintree County (1957), for which she was nominated (put forward for consideration) for an Academy Award for the first time. In Suddenly Last Summer (1959) she received five hundred thousand dollars (the most ever earned by an actress for eight weeks of work) and another Academy Award nomination. In 1956 Taylor and Wilding separated, and in February 1957 she married producer Mike Todd. Taylor was shaken by James Dean's death and her friend Montgomery Clift's (1920–1966) near-fatal automobile accident, which occurred when the actor was driving home from a party at her house. In March 1958 her husband Mike Todd died in a plane crash. Taylor began trying to ease her grief with pills and alcohol. Her performance in the film Cat on a Hot Tin Roof (1958) won her an Academy Award nomination and led to a relationship with singer Eddie Fisher, who had been Mike Todd's best man at their wedding. Soon after his divorce from actress Debbie Reynolds (1932–), who had been Taylor's matron of honor, Taylor and Fisher were married in May 1959. In 1960 Taylor turned in one of her best performances in Butterfield 8, for which she won an Oscar as Best Actress. A few months later, in 1961, she signed with 20th Century-Fox for $1 million for the film Cleopatra, also starring Richard Burton (1925–1984). The two stars were soon romancing off the set as well as on, leading to criticism from the Vatican, which referred to the two stars as "adult children." Upset and confused over her tangled relationships, Taylor attempted suicide in early 1962. By 1964, however, she and Burton had each divorced their spouses and were married. for the U.S. Senate in Virginia. According to one biographer, Taylor broke "all the rules for being a good political wife." She had also gained considerable weight, and the press attacked her about it. After Warner was elected, he and Taylor divorced. Taylor then moved to Broadway for the first time in a well-received staging of The Little Foxes. She and Richard Burton appeared together in a 1983 production of Private Lives, but critics felt that the dramatic spark between them was no longer there. In 1983 Taylor checked into the Betty Ford Clinic in California for treatment for her alcohol addiction. The death of Burton in August 1984, however, combined with back pain and general ill health, led to her return to drinking and drugs. Taylor was also alarmed as a number of her friends, including actor Rock Hudson (1925–1985) and fashion designer Halston, became ill with AIDS. Taylor began to speak out on behalf of AIDS research. In 1985 she became the cofounder and chair of the American Foundation for AIDS Research (AmFAR). Her "Commitment to Life" benefit of that year was the first major AIDS research fundraiser staged by the Hollywood community. Taylor returned to the Betty Ford Clinic in 1988, where she met a forty-year old construction worker named Larry Fortensky. Their friendship continued outside the clinic and they married in 1991. In 1993 the Academy of Motion Picture Arts and Sciences honored Taylor with a special humanitarian (supporter of human welfare) award for her years with AmFAR. In 1994 Taylor returned to the movies after a fourteen-year absence for a small part in The Flintstones. She then announced her retirement from films. Her marriage to Fortensky ended in 1996. In February 1997 Taylor participated in the ABC-TV (American Broadcasting Company-television) special, "Happy Birthday Elizabeth—A Celebration of Life," which marked her sixty-fifth birthday and raised money for AIDS research. The following day she underwent an operation to remove a two-inch tumor from her brain. She also underwent operations on her hip and broke her back in 1998. In the summer of 1999 she fell and suffered a fracture to her spine. In May 2000 Taylor was dubbed Dame Commander of the Order of the British Empire, the female version of a knight. Queen Elizabeth (1926–) presented her with the award for services to the entertainment industry and to charity. That same year she was given the Marian Anderson Award for her efforts on behalf of the AIDS community. She also returned to the hospital briefly after coming down with pneumonia. Taylor is a beautiful, much-beloved woman with a larger-than-life presence, both on and off the screen. Amburn, Ellis. The Most Beautiful Woman in the World: The Obsessions, Passions, and Courage of Elizabeth Taylor. New York: Cliff Street Books, 2000. Heymann, C. David. Liz: An Intimate Biography of Elizabeth Taylor. New York: Carol Publishing Group, 1995. Kelley, Kitty. Elizbeth Taylor: The Last Star. New York: Simon and Schuster, 1981. Maddox, Brenda. Who's Afraid of Elizabeth Taylor? New York: M. Evans, 1977. Walker, Alexander. Elizabeth: The Life of Elizabeth Taylor. New York: G. Weidenfeld, 1991.